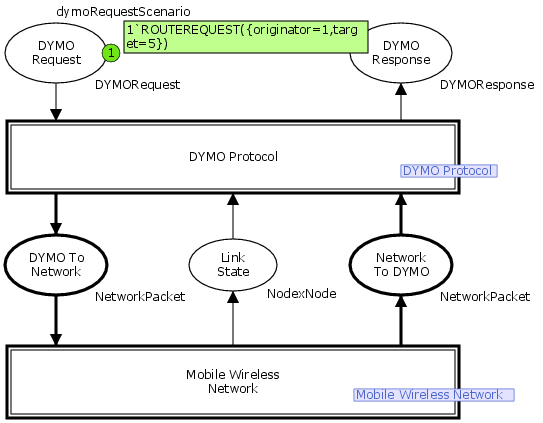 This model implements the IEFT protocol Dynamic MANET On-demand Routing Protocol (or DYMO). K.L. Espensen, M.K. Kjeldsen, and L.M.Kristensen: “Modelling and Initial Validation of the DYMO Routing Protocol for Mobile Ad-Hoc Networks“, In: Applications and Theory of Petri Nets, 29th International Conference, PETRI NETS 2008, pages 152-170. Volume 5062 of Lecture Notes in Computer Science — Springer-Verlag, June 2008. The model id suitable for state space analysis. The topology of the network and the desired scenario is configured using the declarations in the Scenarios declaration group. The default settings are suitable for analysis on a standard computer.